A perfect storm – of what? The podcast goes into a discussion about the online woodworking community… And, at first, the comments were pretty complimentary and tame. It’s a great way for people to share their experiences – to show what they are building and how they are growing in the craft. Had the conversation ended at the five minute mark, It would have been a great topic to cover and things would have sat OK with me. Alas, they couldn’t leave well enough alone. In the next five minutes, I learned that the Internet is basically awash with a bunch of idiots claiming to be ‘experts’ on every topic, leading the poor beginning woodworker down the ‘wrong path’ to frustration and a lifetime of failure. Woah. Hold the phone, fellas. I do get that some folks may or may not have a total grasp on the finer point of technique. But, I know a great number of woodworking bloggers, and I really have yet to run into one who claims to be an ‘expert’ on the topics they write about. The claim was made that no one is vetting the level of expertise of these bloggers, and there is plenty of bad information floating around out there pretending to be the voice of authority. I have seen people cut joints that I’m not sure would be the best for the particular situation, but I have seen plenty of techniques that are plenty sound. Besides, if those techniques work for the particular woodworker, why not see how they are done? The question of shop safety was also brought up. Some of the videos out there can be downright frightening to watch, with the one I posted here being example A. But, believe me, if someone goes out and puts up a post that’s not safety-conscious, the readers are going to be the ones who weigh in it. This was identified as crowd sourcing, and trust me, it works. Heck, I’ve had folks weigh in when I don’t have my safety glasses on while I hand plane. Another point of emphasis is that the more stuff a woodworker builds, the better they are. Therefore, if someone build dozens of pieces of furniture of one style, they should be looked to as the expert in the field. I can see the logic in this, but it would be a stretch to say that this is a 100% guarantee that they are truly better. Think of it this way – if a person has been practicing the violin for 40 years and has perfect playing form, but can’t make the instrument sing, why would I want to listen to the performance? If someone has been playing for five years and can bring down the house, why would I not want to hear that? When I see younger woodworkers who have less than several decades of experience – David Marks, Rob Bois, Shannon Rodgers, Kari Hultman – cutting tight joinery and making it work -I am encouraged to see the new generation of woodworkers coming along to help pass the craft to my children and their kids. The video hosts went on to say that only people vetted by the woodworking magazines or by well-known schools are the ones who really truly understand and can teach the proper methods. With their high level of expertise, they are the ones truly qualified to teach how to build. Nonsense. People who can woodwork are an awesome bunch of people, but it also takes an incredible amount of skill to be able to teach others about the craft. Communication, interpersonal skills and desire mean a lot. I had the honor of taking a class from Marc Spagnuolo when he was in his late 20’s… and his teaching skills were light years ahead of some of the other ‘more experienced’ instructors I have taken classes from. Another thing that struck me as odd … we know that all woodworkers have their own preferences on joinery. And, after years of doing things only one way, they tend to rely on those same joints and techniques for most – if not all – of their projects. I contest that it’s good to get a wider, more diverse vision of how things can be done. If I have said it a once, I’ve said it a million times – there are about a thousand ways to cut a particular joint, and they are all right if they make for tight joinery that can take the abuse. So, say, if Chris Becksvoort hand cuts his dovetail a certain way, does that mean that machine cut dovetails are inferior? How about box or finger joints? Splines? Should they not be considered valid because someone prefers another style of joinery? And, while passing on the information is fine, what about the inspiration? David Life is a woodworker I have profiled before, and he does his work in spite of being legally blind. I find it fascinating to learn from David how his techniques have had to evolve as his eyesight faded. Hearing stories about woodworkers like David help make me a better woodworker. Just reading about or watching ‘established and vetted’ woodworkers leaves me flat. I need to see the stories of woodworkers like me – toiling away in their shops and turning out great work on the weekends and after hours – not just the ones who do it full-time for a magazine or at a woodworking school. I contest that online woodworking is far from the perfect storm of stupidity. In fact, this online collaboration has done more to get new woodworkers off their behinds and into shops that many of the established woodworking sources care to admit. And, it offers exposure to a rich variety of techniques I may not have considered in my woodworking. Is it perfect? Nope, but either is the other option where only a few ‘masters’ control what content is released to the masses. If you would like to hear about why I or other bloggers do what we do, check out our take on things on the fifth edition of the Modern Woodworkers Association’s online discussion. Oh, and keep on blogging and building. I see the perfect setup the way things exist. Hi, all. I’d like to invite some people to come on the next episode of Shop Talk Live and debate this issue and a friendly, constructive way. I think there is an honest philospohical disagreement lying below all the wind and smoke. Anyone game to come on? The easiest way would be to have some one come into our studio in Newtown, CT, but we are also working on skyping people into the show, too…. By the way, thanks, Tom. You have been fair throughout, from your initial post onward. Thank you, Asa. In situations like this, I would rather address the concerns up front than have animosity build in the background. This honest discourse is how we’re going to eliminate any confusion and address the concerns. I would be more than happy to be a part of any discussion/debate on this topic. Obviously I can’t fly in to CT but I am certainly available via Skype. If you guys have trouble getting Skype going, I’d be happy to host the conversation on Wood Talk Online Radio. Tom, I went back and watched the podcast, and I think to be fair, FWW is guilty of what they are critical of. PWW is too. Many of the articles appearing in both magazines are written by magazine employees, not professional woodworkers. As skilled as Chris Schwarz and Asa Chritiana are, they do not make their living as professional woodworkers. And even in the world of pro woodworkers, there is a gulf of differences in skills and methods. I still shudder when I watch Garrett Hack use his tablesaw! 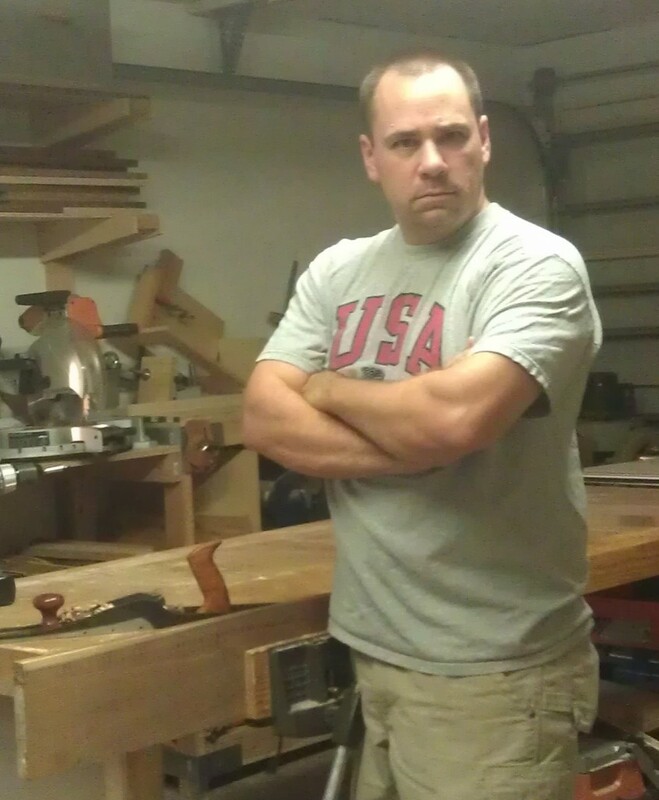 There may be no one better to teach hand tools, but Garrett needs a primer on the tablesaw. Woodworking encompasses a wide range of skills. I agree with Asa regarding how and where beginners should gain their knowledge. Nice post. Very thought provoking. Hey great idea Marc. Asa, Ed, seriously, we have the skype thing already figured out and we have thrown a barb or two your way on our show in the past. It is long overdue that you guys join us some night and we talk. What better way to show your good relationship with bloggers than to come out and join us. It could be fun. All this commenting stuff is silly, right? I just wanted to add some clarification regarding FWW authors. Although editors at FWW occasionally write articles for the magazine (I’m guilty), it is a very small number compared to the articles written by outside authors. 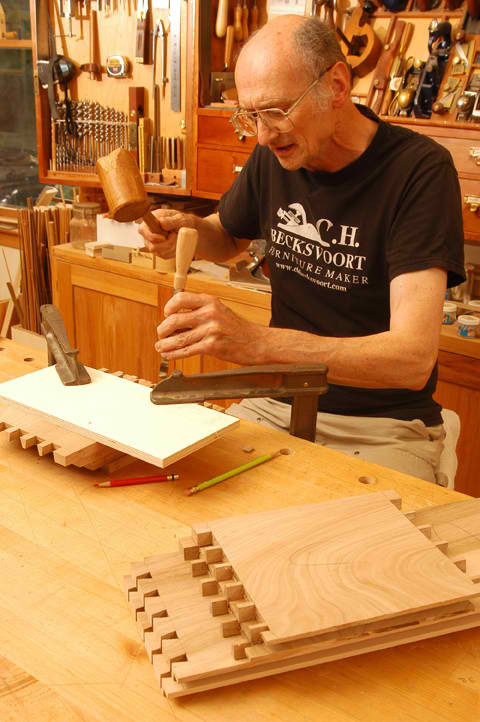 In a typical year, we use around 100 outside authors, all of whom are skilled and experienced woodworkers, both professional and non-professional. When FWW was started back in 1975, it was immediately decided that the articles should come from folks other than the editors. That has always been a guiding principle for the magazine. I suspect it always will be. I should also note that editors are never allowed to write technique or project articles unless they have demonstrated expertise in that specific area. In fact, I would say (based on personal experience) that the scrutiny an editor is put through is more intense. I’ve deliberately chosen to stay out of this whole conversation for several reasons. Mainly because I’m a fence sitter and prefer to wait to see who will be the clear winner in the whole dust up LOL!!! But seriously though…after listening to the episode, then rewinding and listening again a few more times I was a little hot under the collar. After producing podcasts for 6+ years and having built a relationship with so many of the audience, when you hear something like “the comment” it’s a reminder that many don’t consider this form of media legitimate. I’m sure when the printing press came around, all those monks hand writing books were thinking “this is just a phase these kids are going through”. The fact FWW is producing a podcast is a step in the right direction as far as I’m concerned. Not as a way to feel what I’m doing is now legit but instead because it’s finally something I can listen to when I’m NOT producing content. We all say things we may wish were received differently, but the fact is, it’s out there and for anyone who’s listened to WTO over the years is aware we’ve beaten a dead horse more than once. So first I’ll say, Asa shame on you for “the comment” in the first place…but second, thanks for acknowledging it and making an attempt to clear the air. And for anyone who thinks I’m suppose to be in a huge uproar over this and storming around because it sounded like Podcasters were being called bad resources and dangerous to the audience…I was the first woodworking podcaster, I’ve been called worse and told by plenty of people I was crazy for ever thinking this form of media would take off. I’m still here, and going no where. After 6+ years you hear it all. First, Asa, I’d love a chance to discuss this topic with you and others. I was recently involved in a similar discussion that spun out of control, largely because of the limitations of twitter. If you do put together a discussion, I’m throwing my name into the hat. Secondly, I don’t see what the fuss is about. Asa seemed to describe the over-arching issue of the internet. One could argue that it over-levels the playing field. My larger problem with this conversation is that Asa described both pros and cons of the internet woodworking community, but most people don’t care. Tom’s response literally states that as long as Asa complimented the internet, his comments were great, but when he offered criticism, he was wildly off base and offensive. Is there no criticism allowed within the internet woodworking community? The criticism of Asa has been well received and unapologetic. Why is that acceptable? Is Asa being treated differently because he’s viewed as an outsider? I laughed last night when I first saw this. I thought woodchat had laid the battle lines pretty well. I guess Asa missed that one. Eli, my man! To quote John McClain in Die Hard, welcome to the party, pal! Now, Eli, how could I have ‘literally’ said I can’t accept criticism when I posted your comment in its entirety? What Asa said couldn’t be left hanging out there… that we should only learn from properly ‘vetted’ masters? That only if you had put in the requisite 10,000 hours can you truly instruct? If that’s the case, Eli, who vetted you? And, an even more important question – is criticism of Rough Cut even allowed? I’m sure you guys get critical e-mails, but where do those critical e-mails get published and responded to? I have posted 922 posts over the past nearly five years.. .and every single one is an invitation to the readers to weigh in. Check it out… my comment section on every single article is still open for readers to weigh in on. And, I get ‘vetted’ by my readers on a regular basis. Asa’s not being treated as an ‘outsider’ – his statements seemed to paint everyone online with the same brush. If he could point to some specific examples – such as the crazy foot-started tablesaw video – it might have helped illustrate his point. As far as giving you a chance to laugh.. that’s awesome! When I want a good laugh, I break out some of the old Bill Cosby albums like Why is there air? Man, that one is a hoot. Hope you are working on something fun in your shop. I always went for Cosby’s “Himself.” The dentist bit gets me every time. There’s a bit of miscommunication here, though I got some of the benefit of it. I didn’t intend to suggest the YOU personally can’t accept (I said “allow,” but I’m glad you substituted “accept.” It’s more accurate.) criticism, but that the community as a whole resists it. This whole conversation is very hard because it’s about the community at large, so individual examples mean very little. Admittedly, there’s an issue of context when I present them like this, but you seem to accept the premises of Asa’s criticisms. What was the offense that struck you the wrong way? I’ve written a transcript of the pertinent part of Shop Talk Live. I’ll have it online shortly so you, and everyone else, can reference it. In a related note, does anyone have a suggestion for where to post my material? Is wordpress easiest for everyone? Google+? P.S. I’m not sure how to respond to the questions about myself and Rough Cut. I try not to speak on the record about Rough Cut. I work on the show, but I am not a representative of it (though I’m aware it’s a little hard to separate myself sometimes). I will say that some criticism of Rough Cut can be found on most major woodworking forums. I don’t know their official policy on getting involved in these discussions. I stay out of it. I don’t know who vetted me or if I have been. I’m not sure it’s relevant, but I’ll think on that. I’d really like to discuss that, too. I had given up that anyone really cared about that, but I’m glad to see it’s still on people’s minds. I’m going to address some of the present situation before I go back, though. That woodchat ties into this in someways, but also seems to have taken on it’s own personality. If you want to bust a gut, Steve Martin’s Comedy is not Pretty is awesome. You are right, Eli, perhaps there has been some miscommunication. Please allow me to clarify. You state that I accept the premise of Asa’s criticism. And, sure, there are plenty of valid points. 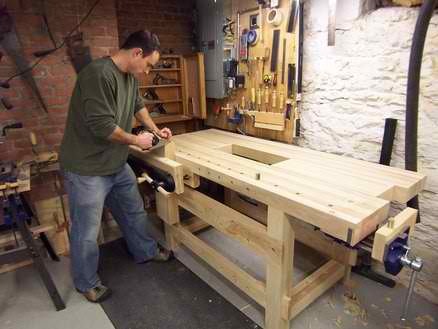 But, I would liken this to something like watching a how-to video on how to cut a tenon on a table saw. The demonstrator may show a safe, accurate way to do the deed, but if he or she isn’t wearing safety glasses, that doesn’t make the entire video worthless. In the same way, I agreed with some of Asa’s criticisms which you illuminated. However, I did object to the statement that you should only learn from people who have been ‘vetted’ by editorial boards at woodworking magazines. That you can’t learn from anyone who built his or her first set of drawers.. .that’s where my concern lies. We can debate this for years to come – I’m sure. However, I didn’t want those first comments to become unchallenged woodworking canon without weighing in. After all, if this vetting process was to be seen as the be all and end all, where does the vetting authority come from? Attorneys have to pass the bar exam, and doctors have to be licensed to practice their professions… is someone advocating that you need to have a ‘guild card’ to teach others? I would both welcome and enjoy a discussion on what was previously discussed on woodchat. As for caring about this, there are a lot of hobbyist that are very passionate about woodworking, even if we only get to touch our tools a few days out of every month. We want to see this craft continue onwards for generations to come as well. It may interest you to know that the woodchat discussion from a few months ago was brought up in another woodworking chatroom. It turned out to be a very good and productive discussion that I think was both positive and beneficial. I do believe there are misconceptions and statements taken out of context on both sides of the table (myself being as much at fault as anyone). I am hoping that perhaps this will result in a stronger woodworking community as a whole, both online and off. I think we’re zeroing in on the spark. I didn’t get the impression “that you should only learn from people who have been ‘vetted’ by editorial boards at woodworking magazines.” I heard it as Asa highlighting a downside to the internet as a source of information. He points to magazines and established schools (NBSS, woot!) as places where this particular issue is largely neutralized through history, reputation, and PR and financial concerns. If it’s not too much to ask, please point out the section(s) that gave you that message. This is a point that showed up in some other comments, too, so if others want to check it out and respond, the more we can sort this out, the better we can react it in the future. Hopefully, we will come to understand where Asa, Tom, myself, and everyone else failed to communicate. I’d heard through the grapevine that it was further discussed, but I couldn’t find any record of it. A friend of mine at NBSS was in the conversation, though I can’t remember his screen name. I’m glad it was productive, though. I’d love to carry on the conversation outside of twitter. I’m excited to get my ideas out there in full so we can get on the same page. There may be cases where a guild card or today’s equivalent would be important to have. I do think where it would or would not be needed is the intended audience. Lets look at accredited vs. non-accredited schools. There is little doubt that the piece of paper a student earns out of an accredited school holds a lot more weight then the piece of paper from a non-accredited school to a hiring manager. The non-accredited schools have their place for learning new skills (learning how to use a new application, learning how to dovetail, etc). Many of these do have a certificate program, but these are often used by either hobbyist or someone already established in a profession to expand their skill set. As a hobby, I enjoy woodworking. I have taken classes, both at a bench and online, and have begun to learn many skills as a result. If I had to take classes at a higher level then I do today, I probably simply wouldn’t take them. At the end of the day, woodworking for me is still a hobby, and I have a family to support so the additional cost for taking a class from a guild card holder would likely stop me from taking a class like the for sometime. That said, if I decided on a total career change, and wanted to do woodworking as profession, you would see me standing in line hoping to be accepted at NBSS. Why? Because I do value a strong education in the field a person is working to both gain a strong skill set and to be competitive in that field. I do have a small blog, that I am able to post what I finished and to also occasionally discuss through what I have learned and the mistakes I have made. I don’t pretend to be an expert anywhere (the blog is named Sawdust Newbie for a reason!) but, someone could say I am trying to teach someone something. Would I need a guild card? I probably would shut down my blog before I went through the educational and experience requirements for one. My argument here is I think there is a need and room for both. One of the reasons I like woodworking is that there are many different ways to accomplish a complete project build. The analytical side of me enjoys trying out the different ways out there to figure out what works well in different situations. As a result I value the opinions and experiences from all levels in the craft. You don’t want to learn to fit a drawer from a dude who is figuring it out for the first time, because the fifth time he does it, it’s going to be worlds away and the tenth time he’s done it, he’s going to really be zeroing in on the best way to do it. Hey, if you’re out there and you’re shopping around for information on the Internet, my advice is, look at what the person has built. Whether we’re hiring and editor to come work here, or we’re vetting a new author, or I’m at a show meeting somebody, again and again I find it true to be, and in my own life, the reason you’re a better woodworker than me is because you’ve built more pieces than me. you are a better woodworker than me, mike, straight up. And that’s just because you’ve built more stuff. If I can watch Kari Hultman build stuff without several decades of experience, and do it well, why not learn from her? How about Rob Bois (in his early 30s)? How about Marc Spagnuolo? How about Tommy Mac? Just because they haven’t e “built every single shaker piece about 25 times each” shouldn’t disqualify them from being able to teach what they know. So it’s kind of, that’s one thing that bugs me, you often see advice given out by people who are building every single major piece of furniture for the very first time, but there’s nobody there to call BS on what they are teaching you. There’s no Sheriff. At least, if you go with one of the established magazines like Pop. Wood or Fine Woodworking or one of the established schools, they have a reputation and a history and a lot of money at stake to not send you down the wrong road. No one to call BS? I reiterate – I’ve been blogging for the past five years. Nearly a thousand posts. Everything I put out there I advertise on Twitter, Facebook, Google+… I invite people to come and leave their thoughts on what I’m doing – good, bad or indifferent. If I do something unsafe or incorrect, I hear from my readers. It’s crowd sourcing, but it works. We could get into the post-analysis of what was said for the next few months, but we still come back to the crux of this issue – who determines what is ‘legit’ and what isn’t? Who is the proverbial Sheriff who gives the thumbs-up or thumbs-down? How does someone prove they are qualified? Do you have to post that on your blog? Do they give you a card to carry like a license? I know who you are talking about, and I am glad to here he further discussed with you as well. I agree, we do need to discuss outside of twitter, as it is limiting on broader discussions such as this. Mike – Thanks for your comments. I agree with you – in this world, doctors, lawyers, teachers, pilots.. they all need formalized education. You don’t want a unqualified doctor trying to do a heart bypass operation. And, if you are standing trial, you want someone who has studied law and demonstrates skill in it. But, folks like me are trying to show you what we’re learning in our shops and – maybe – the unique ways we approach woodworking. No one is going to go to jail or flying in the back of my shop at 30,000 feet. Maybe they’ll learn why I use dowels instead of mortise and tenons, and how I get my joints nice and tight. For someone to say that content like this isn’t important or is not worth looking at, it sounds elitist. Especially in this day and age when the normal barriers to communication (Getting a book deal, signing a TV contract, getting published in a magazine) have been broken down and we can all participate in the discussion. Did we really just watch that guy “jump start” his table saw? Unreal Video, we pray his little girl was no where near the scene. Great comments here! I love that we all care so much for our profession or be it your hobby. So to segway to our world, it’s a big plus or minus for me. On balance, it’s a plus, but I was espousing some of my pet peeves about it the other day in the lunchroom. The great thing about the internet is the interactivity we all get with each other and then also you get the power of the crowd. You don’t even need someone on the camera, and you can start sharing woodworking information with people, which is awesome! here’s the other upside, if you’re new to the craft, you can find a lot of free stuff. You can really get a real great sense about all the types of woodworking that go on and what it takes to get involved in this craft and even getting started on setting up a little sort of shop in the corner of a room or something. So I’m way cool with the guy who is just saying, “Hey, I’m learning as I go. I’ve built these four pieces so far.” They’re up front a about where they are in their journey. Regardless, I still notice that his most definitive statement is “You don’t want to learn to fit a drawer from a dude who is figuring it out for the first time,” but I don’t get the impression that, at any point, he’s saying ONLY learn from certain sources, or ONLY from people with so many hours. I took his point as: the internet has this particular issue, magazines and schools largely avoid it, most importantly, look for yourself who you are learning from. He then provides his personal metric for judging what someone has to offer. If you want to find out who to learn from, look at their portfolio stuff. If you say “I want to make stuff that looks like that.” And look closely. Look at the gaps in the drawers and the joints and the finish and really take a good hard look at it. I’m listening to the MWA podcast, right now. It sounds like y’all have moved us largely past this particular issue, so I can get to the meat of my problems. This ‘guild card’ idea is very interesting. I have been considering my NBSS experience and realized the huge misconception people have about that place. I believe it extends to a lot of the woodworking world and relates to this discussion of vetting and community. I’ll work on my thoughts. P.S. Ironically, of your four unvetted internet stars: Kari worked for Popular Woodworking; Tommy went to NBSS; and Marc worked with David Marks. I’m not saying that they don’t count toward your point. The way we define “vetting” will affect our stance on the topic, though. I think Asa may have been judged harshly because of his job title as much as his argument. I believe sharpening is one of the first chapters in almost every hand tool book I’ve read and is stressed by everyone I’ve heard discuss the subject. Provide some specifics for your speculative accusations about hand tool users, Asa. Your comments are completely baseless. Just what? I wonder where that comment was going? Hand tools can’t produce quality furniture? What are they supposed to do instead? Give up and buy a Powermatic table saw? Or a brand new router and jig setup because they’re clearly superior?! How about a little practice with the craft. Do you think people are too stupid or lazy to become proficient with hand tools? The words of an unworthy, rank amateur. I am a little late in this, but wow. I think the perfect storm of stupidety started when the camera came on and continued through the apology, and into changing the name of the video later. If you say something, stand behind it. Otherwise you just look like a politician that screwed up and backpedals and says you just didn’t understand what I meant. Just wow. That editor needed an editor.